Fly the Sky-way to simplify your vacation plans. Let SkywayCR plan your trip and deliver you to your destination! 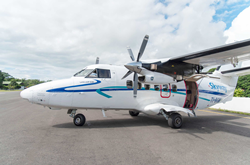 SKYWAY Costa Rica, the newest airline to serve Costa Rica, provides a great way to travel around this popular Spring Break destination. Costa Rica has much to offer to travelers from the USA and Canada who love the warm weather, sunshine, beaches, mountains, wildlife and adventures available – and at a time when much of North America is in the grips of winter. Spring Break is a great time to visit this beautiful and diverse country! In order to experience all there is to do, flying from San Jose to various destinations is the best and fastest way to travel. SKYWAYCR delights in connecting people with nature and can take visitors to the full array of destinations in Costa Rica. Not only can they deliver guests to their chosen location, they also offer all-inclusive packages to experience them. Whether travelers want a family-friendly beach resort, an intimate romantic getaway or perhaps a yoga and wellness package titled Tropical Ashram; there is something for every vacationer. SKYWAY CR provides a complete array of transportation options – from scheduled flights, charter flights, ground transportation, car rental – to helicopter flights. Their Concierge Service stands ready to book hotels, restaurants, tours, spas and every element that makes vacations pure pleasure and relaxation. Fully inclusive vacation packages are also available through the helpful staff at SKYWAY CR. Costa Rica invites you to visit and while you are there – Fly the Sky Way!